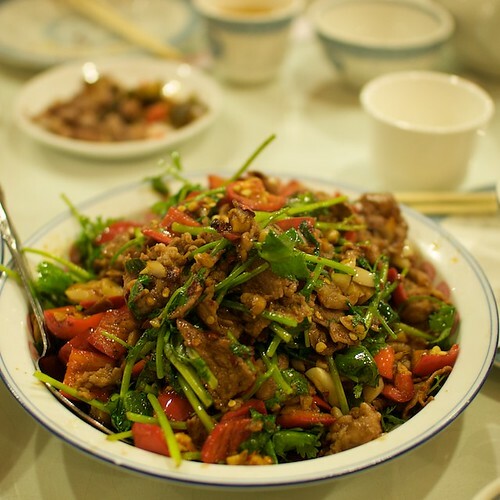 I returned to Hunan Chilli King for lunch a few weeks ago after my initial visit. Although the experience of eating there was painful, it was a good sort of pain and I was soon craving more after. 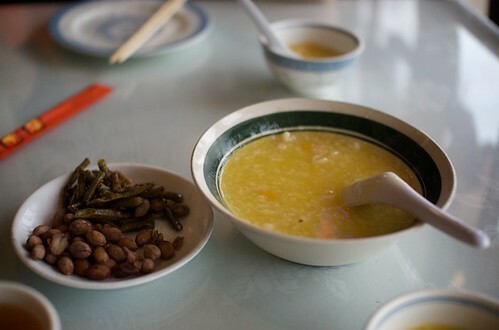 I don’t know if this is only a lunchtime deal, but after the BF and I ordered, the waitress brought out a bowl of porridge with either pumpkin or yam in it as well as the usual small dish of pickled string beans and peanuts. The porridge was bland and comforting, which is a sharp contrast to the highly-spiced dishes to come. I’d like to think that having a bowl of this before diving into the real dishes coated my stomach enough to prepare it. 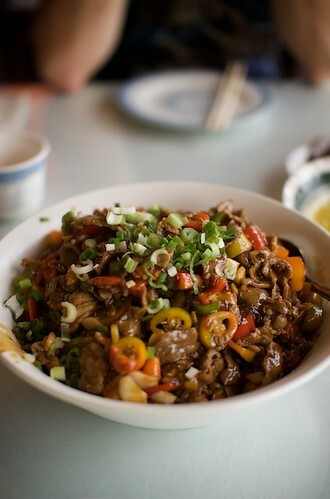 This time, I ordered what I guess would translate to ‘water-boiled lamb.’ It’s thin slices of lamb braised in a thin spicy, garlicky sauce with plenty of chopped peppers thrown in. There’s a certain, unmistakable smokiness in Hunan Chilli King’s peppers that I don’t usually notice in other peppers. It comes close to the unrivaled chile peppers that I had in some dishes in Fujian province in China. The best way I can describe it is that it’s like a lingering, smokey foreshadowing of the hot pain that’s about to come in few seconds after biting into that pepper. The bowl of water-boiled lamb was gigantic, but about 1/3 of it was full of chile peppers, bean sprouts and garlic. What’s good about this dish is that you can take the leftovers home and then toss them in the wok with some rice noodles and you’d get another meal or two thanks to the extra sauce and peppers. Whenever I have friends who say they like and can handle spicy food, I think about bringing them here. I’d like to think that I’m fairly tolerant of heat, but I’m only man enough to barely handle the medium-spicy here. I’d really hate to see what the extra spicy is like. I’d like to quote Russell Peters and warn anyone thinking of going to Hunan Chilli King that “somebody’s gonna get-a-hurt real bad.” Walking in, it’s easy to see that the restaurant specializes in one thing: oily, garlicky pain. Just take a look around and notice all the chilli-peppers decorating the walls and columns. It’s a warning from the old days when people used to put their enemies’ heads on a spear and use it to warn off other potential enemies. It says, “don’t even bother sitting down if you have any doubts about eating spicy food.” Seriously, if you think a regular spicy tuna roll is too spicy, keep on driving. Whenever I go to a new restaurant, I like to look around and see what other people are eating. This is difficult at Hunan Chilli King because most of their dishes look the same: garlicky, red, and spicy. Luckily, one of my dining companions had come here before and could suggest a few dishes. My favorite dish of the night was the stir fried sliced lamb. Each bite of lamb was thinly sliced with a good ratio of meat to fat. The peppers and garlic made this dish extra exciting because each mouthful hurt, but oh, it hurt so bad. Normally, I’d complain that there’s way too many peppers compared to the pieces of meat, but it actually worked in this dish because some of the peppers were mild enough to chew on. But since it’s hard to tell which ones are heat-bombs and which ones are mild, tread lightly. We also ordered another meat dish, but with chicken instead of lamb. On hindsight, I’m not sure we should have ordered something that was so much like the last dish save for the protein substitution, but now I can confidently write that if you don’t like the taste of lamb, this chicken dish will get you the same spices without any of the gamey taste. The chicken stir fry also came with the addition of pickled long beans, which were deliciously salty and crunchy. The menu at Hunan Chilli King is not the most vegetarian-friendly, but the two vegetarians of our four person group didn’t go starving. As long as someone in your party can speak Mandarin, you should be able to get (supposedly) vegetarian dishes. 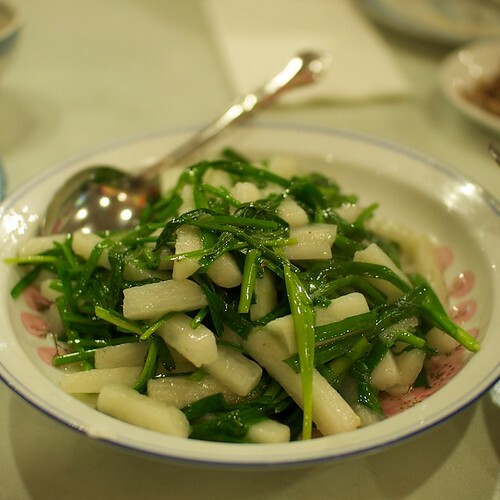 For the vegetarians who eat egg, there’s the ubiquitous chives (or is it Chinese leeks?) and scrambled eggs. Since the BF doesn’t eat eggs, the waitress was nice enough to replace the eggs with nagaimo yam. I’ve never had this variation of the dish before, but thought it was a great idea. I liked the slimy, crisp texture of the yam in combination with the pungent flavor of the chives, but this may not be for people who get thrown off by strange textures. I returned to this dish several times during the night to give my mouth a break from the heat. 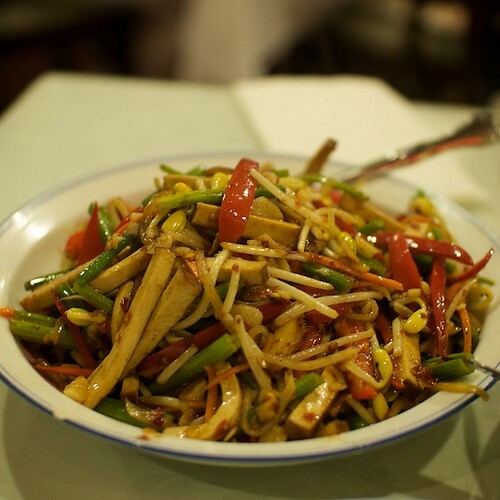 We also ordered a sliced baked tofu stir-fry type dish with bean sprouts, chinese celery, and peppers. It tasted good and had plenty of heat, so I was glad that the kitchen wasn’t skimping on putting peppers in the vegetarian plates. I’d like the ability to conjure this dish out of thin air to combat those people who say they hate tofu because it’s bland and tasteless because this dish was certainly not. My favorite vegetarian plate of the night was the home-style fried tofu. 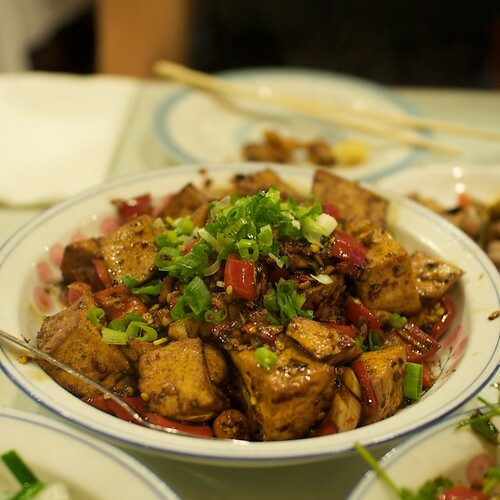 The tofu was crispy and savory with sauce on the outside, but soft and almost silky on the inside — what a perfect combination. This dish wasn’t as spicy as the others, but maybe it was because the soy-based sauce was more on the sweet side than anything else we ordered. 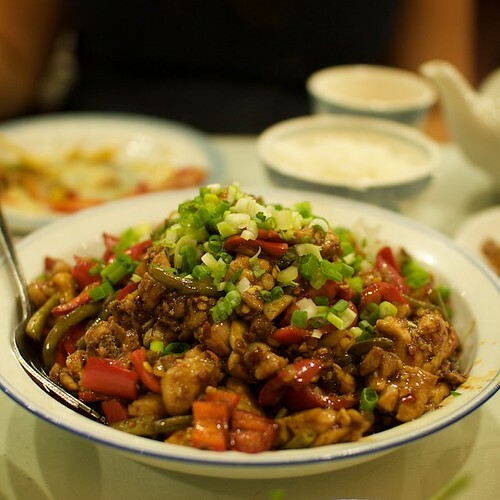 Hunan Chilli King is a good change of pace for anyone who wants spicy Chinese food but is getting tired of Chung King. This place doesn’t use any numbing peppercorns, so it’s certainly for those who are fans of straight spicy food. I downed a cup of the ubiquitous Chinese yogurt drink while eating at this restaurant, but even that didn’t save my stomach the next day, but it was worth it. Perhaps Tasty Noodle House is a slight misnomer. It’s not that their noodles aren’t tasty. They are quite tasty. But their baos are even more tasty, which the owner will not hesitate to point out to you as soon as you enter the small restaurant a few doors down from the legendary Golden Deli. 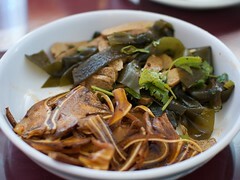 We started with the ubiquitous combination cold appetizer plate with sliced pig ear, baked tofu, and seaweed knots. It was spicy and decent, but seemed like more of an afterthought. I ordered my usual “let’s try this place out” noodle dish, hong sao niu rou mian (spicy beef noodle soup), with knife-shaved noodles. The noodles were wide, chewy without being undercooked, and satisfying. 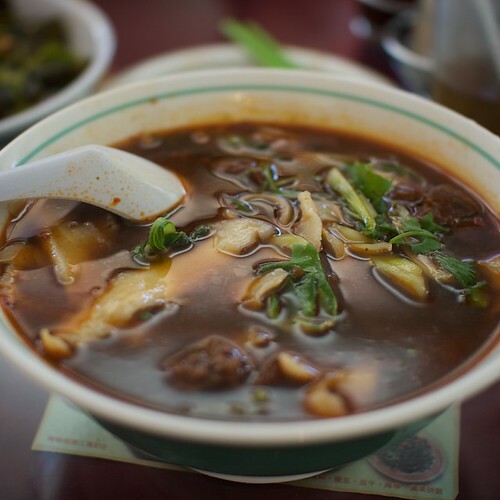 It was a little unwieldy to eat such large noodles with slippery plastic chopsticks; I was glad I wore black to hide the soup splashing everywhere that day. I had ordered the soup to be mild, but the woman must have thought I was being modest and upped the heat level in my soup. The broth tasted like liquid pain. Beefy, delicious, liquid pain. The funny thing about spicy broth is that it hurts for a bit, so I stick to the noodles, and then I somehow forget or block off the memory of the broth being spicy, then I slurp another spoonful and repeat the pain. The pieces of beef in the soup were okay, but nothing to write home about. More and more, I’ve started noticing that the beef in hong sao niu rou mian tastes like corned beef. The BF wanted knife-shaved noodles too, but since he ordered the Szechuan dan dan mian sans meat and eggs, the woman strongly suggested he get the thin noodles instead. At first there was some confusion regarding which noodles were vegan but we sorted it out eventually. According to the woman, the knife-shaved noodles and one type of thin noodles did not contain egg, but the yellow noodles did. The dan dan mian came with a generous dollop of crushed chili as well as peanut sauce. I prefer the dish this way because the rich oiliness of the peanut sauce helps balance the pain of the chili. The noodles in his dish were also cooked to the perfect amount of chewiness. Our whole time there, the woman was lamenting that we weren’t trying her famous baos, so we ended up ordering a plate of the bao stuffed with Chinese greens (either jia cai or jie cai) and shiitake mushrooms. They were well worth the praise! The bready part was slightly sweet and soft while the filling was perfectly seasoned. It was neither too salty nor too savory. It was just an ideal balance of greens and mushrooms. On our way out of the restaurant, the woman cheerily exclaimed, “Next time you come, you’ll know what to order!” in Chinese and she’s right. While the noodles were decent, next time, I’m going to stuff myself with bao, both the meat and meatless versions.